You are viewing the archived 2014 ratings for New Zealand health insurance. Go to the current health insurance ratings. If you’re serious about getting the best available healthcare, compare health insurance with our customer satisfaction ratings. As premiums for health insurance have risen, more than a third of the respondents to our recent survey of New Zealanders have reduced or changed their cover. Indeed, broader cover is too expensive for more than half the respondents, who can only afford a surgery and specialist policy. And an even greater number – close to 7 in 10 – are willing to sacrifice money in other areas before relinquishing their health care policy. More than 40% consider it more important than home and contents insurance! 19% receive more benefits (or don’t have to endure waiting periods) as a long term member. Only 9% of survey respondents feel that ‘all health insurers are the same’. There’s plenty to tell each policy apart, and on the contrary to what some New Zealanders may think, it’s not terribly difficult to switch. In fact, you could probably get the job done over the course of a Saturday morning. Grab a cup of tea and we’ll help you through the process! 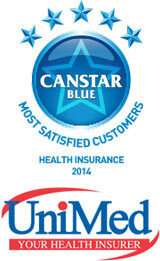 We’ve looked at many of the big name insurers in our latest survey of health care cover satisfaction. Looking at five different brands, Unimed achieved our award for the second year running – just edging out Accuro Health Insurance, Sovereign Assurance Company, Southern Cross Healthcare, and NIB (which includes Tower). The award-winning insurer took our five stars for overall customer satisfaction, value for money, the speed of its response to claims, and for quality of service. In other results, Sovereign are five star recipients for how satisfied customers were the claims lodgement process, the claims outcome, the speed of its response, and the quality of service customers received. Southern Cross Healthcare were out other standout brand – receiving five stars for ease of claiming, speed of response, and quality of service.